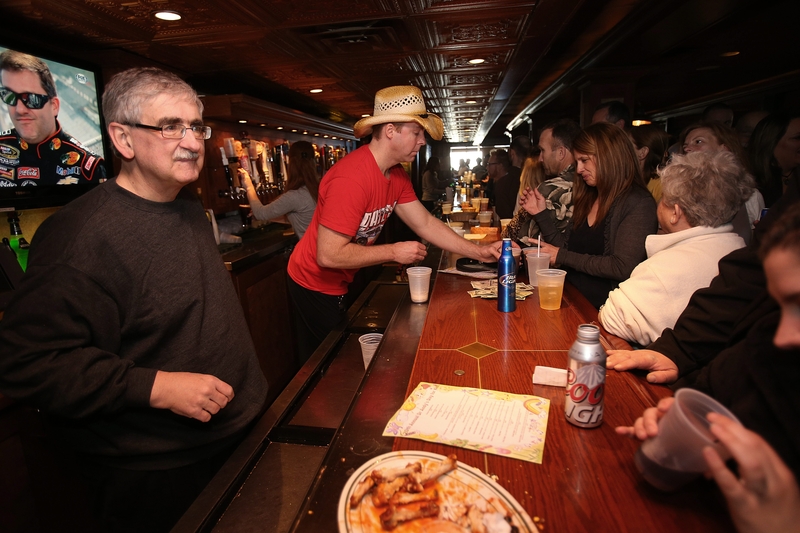 Father Richard “Duke” Zajac, left, and Mike Ryan of Clarence dispense drinks at the Buffalo Brew Pub on Sunday. See a gallery of photos from the event at www.BuffaloNews.com. The Rev. Richard “Duke” Zajac has talked to a lot of people in his 31 years as chaplain at Sisters Hospital. That background, and the time he spent at Casey’s Tavern in Black Rock as a young man, served him well Sunday when he joined physicians from Sisters Hospital behind the bar at the Buffalo Brew Pub in Amherst. It was the 20th annual Dr. Andy’s Day for Kids, an event to raise money for the neonatal intensive care unit at Sisters Hospital. The Buffalo Brew Pub was packed Sunday, but there were no complaints about slow service. There were plenty of bartenders on hand to pour the craft brews, and they raked in thousands of dollars in tips, all for a good cause. About 1,000 people went through the doors, and they dropped thousands of dollars in the tip jars. Money also came from dozens of theme baskets and raffles, with most of the items up for auction put together by the hospital’s nursing staff. The event started 20 years ago when surgeon Andrew Gage was talking with Keith Morgan, general manager of the Brew Pub. Gage had always wanted to tend bar, and the two came up with the idea of having physicians dispensing the brews instead of prescriptions. The proceeds would go to the NICU at Sisters. The first year, about $250 was raised, Morgan recalled. “We thought it was fun,” he said. The event grew each year, and in each of the past few years has raised more than $30,000. Gage was 55 when he died in 2005. But Morgan and others continued the tradition, and changed the name to Dr. Andy’s Day for Kids. Rick Johnson of Pendleton and Dave Sorgi knew Gage and used to ride motorcycles with him. “He was like a light bulb. He would light up the room,” Sorgi said, recalling how Gage would show up at meetings of a local Harley-Davidson club wearing a shirt and tie, in contrast to the leather jackets and boots of the other members. But everyone in the room would smile when Gage walked in, he said. “One thing Andy always said is ‘There’s never enough hugs in this world,’ ” Johnson added. Dr. Andy’s Day for Kids has produced its share of hugs. Bailee and Morgan McPartland couldn’t keep still Sunday as they danced around the pub to the music. The 7-year-old twins were born 12 weeks prematurely at Sisters Hospital, and spent weeks in the neonatal intensive care unit. But you wouldn’t know it to look at them now. The second-graders at Forest Elementary School in Amherst have come to the event for three years. Zajac said the esprit de corps at Sisters makes it special.